“I have no intention of fraud or cheat individual. Starting April 2019 in batches I shall start clearing payments of every individual. Also starting 24th April 2019, on 24th Day of every month I shall send you the list of individuals with their member id and telephone numbers who’s payments are cleared, so that you can validate the payments,” Pasha has written. Speaking to The Cognate, Syed Saif, an investor said the letter was sent by Irfan Pasha at around 1 AM-midnight to a couple of investors on their WhatsApp numbers, who then circulated it to other victims. In his letter, Pasha has urged investors to avoid paying commissions to any private agency to reclaim their money, as he alone is responsible for their returns. He also said that no other individual or employee of the company is responsible for their payments. “For the past couple of months there were conspiracy been made towards me, my family and business. I was getting frequent death and kidnapping threats towards me and my family,” Pasha has written. Saif says he has submitted the copy of the letter to the Bengaluru Crime Branch and wants Minister Sushma Swaraj to intervene in the case. 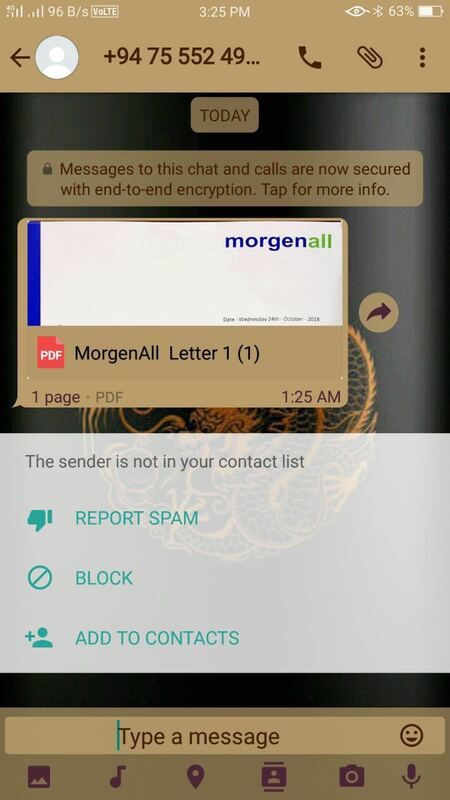 Screengrab of the letter sent to one of the investor’s WhatsApp number. “It’s been more than a month since he absconded, and there was absolutely no communication from him. And now, just a few hours after your article on we seeking Sushma ji’s help is published, he sends us a letter asking us to cooperate with him. This shows he is scared,” said Saif. “There is no guarantee that he will return our money. He only wants to buy more time, by giving false promises. He thought we will cry and shout for a few days and calm down. But when he saw, that we are seeking the Centre’s help, he has panicked”. Saif said, that he and his team are planning to meet Minister Swaraj, once they get her appointment. 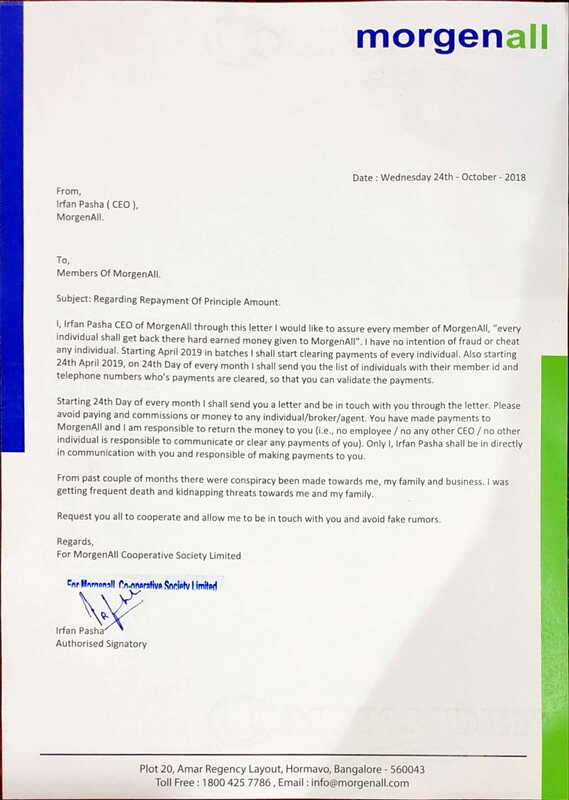 Morgenall, an investment company, which had collected large sums of deposits from the public in Bengaluru, shut down its office last month, leaving thousands of investors in the lurch. The company’s CEO Irfan Pasha and his wife Fathima Maqdooma, who is also a Director of the firm have been absconding since then. The company is believed to have defrauded investors to the tune of hundreds of crores, mostly targeting the city’s Muslim community. Investors in the company believe both Pasha and his wife are currently holed up in Qatar. Subscribe to our free newsletter below to be notified about our articles.